As it is about every other party detail, the venue, theme and decor play an important role in making your events a happening one. It can be a hall or a resort as you’d like. The focus should be on making the celebrations memorable. So, you should do whatever that helps you enhance the vibe of your events. Candlelit dinner tables to floral arrangements that really attracts your guests, these venues can provide it all. This list has cheap banquet halls, AC banquet halls and a stunning resort so that you can take your engagement party celebrations to next level. Go ahead and choose the one that suits you the most. We have got a list of the perfect engagement places in Mumbai. Andy's Boutique Hotel, Malad West, Mumbai is surely the place you’d want to host your first official event, engagement party. It offers three beautiful options for hosting the most happening events in town. There are rooms that are designed to provide comfort and convenience for all its guests. Villas, on the other hand are for the ones who wish to live life King Size. Located at Madh Island, a go to option for Mumbaikars, this banquet hall in Malad is also close to Yoga Ashram and has a catering team to prepare lip-smacking dishes that satisfies the taste buds of your guests. To further enhance the vibrancy of your wedding event, the venue has an in-house decorating team. Goldfinch, Mumbai is a gorgeous banquet hall in Andheri and has one of the best banquet halls in Mumbai. The lavish 4-star hotel is in the prime location of Andheri East and has multiple party areas that you can browse through to find the perfect one for your big day. The perfect location of the venue makes it easily accessible by road, metro and trains This engagement venue offers six beautiful banquet halls of varying capacities to suit every pre-wedding, wedding or corporate requirement. The elegant 3,000 sq. ft. banquet hall - Bay Leaf can host an engagement party with a large gathering. If you have always wanted a lavish and spectacular engagement party, the exquisite Golden Leaf Banquet is just the one for you! This engagement banquet hall in Malad sprawls over a whopping 12,000 sq ft. and can easily accommodate those opulent engagement and reception parties. Located in Malad, this property is easily accessible from all parts of the Western Suburbs and is well connected by both rail and road. At Golden Leaf Banquet, the management decorates the party area and makes it look more stunning for your special occasion. They also whip up a wide range of delicacies that will surely impress you and your guests. One Up Banquets, Malad West, Mumbai is a great venue to host your pre- wedding and reception ceremonies. It is located at a close distance from Malad Station and Link Road which makes it easily accessible for all. The venue serves mouth-watering multi-cuisine delicacies to choose from in both vegetarian and non-vegetarian food. The elegant décor of the venue makes it an ideal option for a grand wedding. It has multiple party areas which makes it easy to have different functions at the same venue. Choose One Up 1 and 2 for your engagement party. However, if you have a long guests list, consider the Grand Hall that has spectacular interiors and mind-numbing décor arrangements. Ceremony Banquet Hall, Thane, Mumbai is situated in the heart of the city and is easily accessible via road and rail. 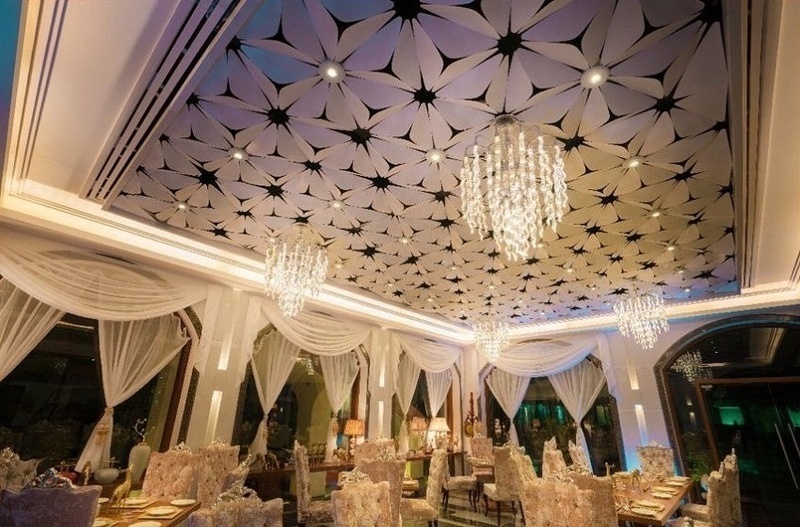 This hall in Thane, Kapurbawdi offers convenience and aesthetic value of the banquet halls, making it a popular choice among locals for hosting several social events such as engagement parties, weddings, receptions, cocktail parties, anniversaries and so on. With all these facilities and a hospitable team on board, Ceremony Banquet Hall, Thane, Mumbai, promises to be a great choice of wedding venue. Ceremony Hall Thane has in-house caterers who serve delicious food to guests.